My baby got the boot, it’s purple, waterproof and here to stay for 3-4 weeks. The it’s-ok-that-you-can’t-run-walk-or-climb distraction baton will be passed frequently between mom, dad and grandma (Yes, Grandma! Score!). And hey, we sprang for waterproof so bring on the garden hoses and swimming pools! Waterproof! Well that just open up many more play options. Does she have baby crutches? How in the world does a little one get around like that? Oh and I thought of a new thing for her to do, she can lay outside on a little blow up raft and draw with sidewalk chalk. That poor baby. And poor you, too. But the purple is, as The Poo would say, very unique. Which, according to her is "Spanish for fancy." Oh sweet baby. Do you have to carry her or can she get around ok? And if you say she has to drag herself around on her little elbows I will just cry. A Barney cast! Rock on! I want one . . .
Just think of all the ways she can accessorize her new "boot!" Wow, I didn't know you could get waterproof casts. And the colour is fab. Poor little poopie, as my mom would say. At least they left her piggies exposed for munching on. They're too cute. Waterproof sounds totally worth it! Also, the purple is gorgeous. I almost want one myself. awwww poor girl! Water proof totally sounds worth it in summer! I guess nibbling on those toes is out of the question? The purple is wonderful, did Avery get to pick the color?? Would have been MY choice for sure! Love the toes, and Grandma to help? Amazing. 🙂 Between all of you – you might just keep her down for a while. Might. Ohhh – you have to paint those sweet little toenails some fantastic sparkling color. Waterproof and purple. Why couldn't they have options like that when we kids? 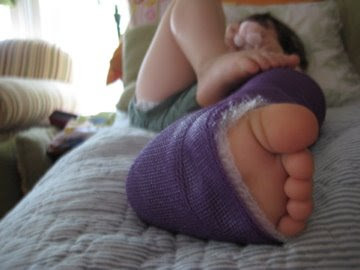 That would have made the 2 months in a full leg cast much more bearable when I was 9. And I think meredith is right. Some sparkly coordinating toe polish is definitely a must! Looks like you need a silver sharpie so people can sign the cast with flair! I have the same question as crystal d — does she have crutches? No, we don't have crutches, but I'll be darned if she isn't already pulling herself around like a seasoned veteran. No nail polish, Avery is not into the girly stuff, unless of course we are talking about blue eye shadow! Oh, poor, poor little girl! My kids are WILD about sticker books. I recommend many many sticker books and repeated viewings of movies with princesses in them. So sorry! I had no idea you could get waterproof casts!